It's a windy and freezing afternoon in Cody. A bunch of women are gathered around a table at the Chamberlin Inn in Cody, chatting about the dynamic of their relationships. "Of us in the room, a lot of us are here because of the place. 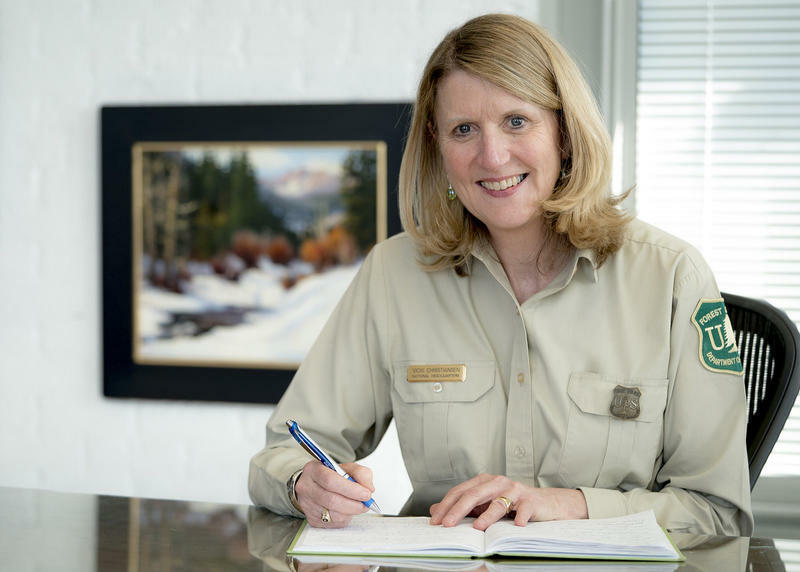 The career became second or was an addition or frosting on top," said Amy Quick, who came to Cody for a job at the Shoshone National Forest. "I realized pretty early on, I had the 'where' figured it out in life. I knew I wanted to stay here but it took a little longer to figure out the other questions," said Amy. 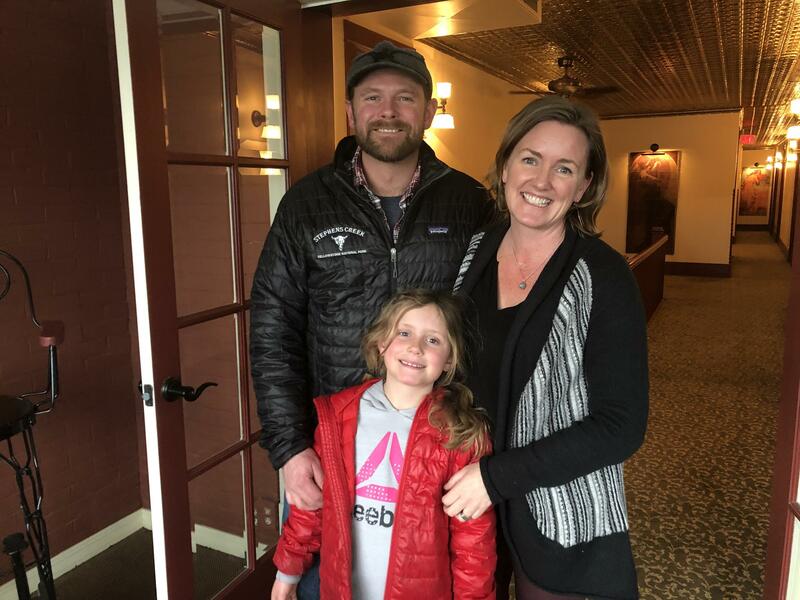 She eventually met her husband, Andy, who owns a small outdoor recreation store in Cody. The business was his passion, and Amy didn't want him to give it up for the sake of their new family. Credit Graph from Headwaters Economics, Data Sources: U.S. Department of Labor. 2018. Bureau of Labor Statistics, Local Area Unemployment Statistic, Washington, D.C.
"I don't think it was a conscious decision that I would make benefits," recalled Amy. "Andy had a passion and business opportunity for outdoor recreation, so it worked out." Amy found a steady job and Andy kept his seasonal one, running the store. This is not uncommon in Cody. David Bullard, the senior economist at the Research and Planning Department of Wyoming Department of Workforce and Services, said there are a lot of seasonal jobs in this area. "Yellowstone [National Park] and Grand Teton [National Park] open for the summer, so there's a huge amount of seasonal employment there," he said. 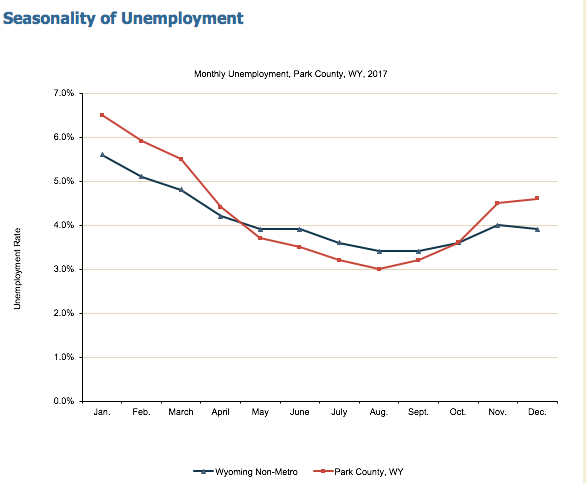 Cody has bigger seasonal employment swings than other non-metro Wyoming communities, mainly because it doesn't have a winter economy. During the winter, Andy works on the business but also picks up other seasonal jobs like carpentry. The Quick's aren't the only ones in this position in Cody. Wyoming's population declined last year while the surrounding states populations grew, but Cody is an outlier of sorts. In the past decade, there's been an influx of people aged 24 to 34 into Park County. A portion of these are women providing a steady income and benefits for their families. When looking at the numbers, more women are in the labor force in Cody than men. And the industries in which women dominate, like healthcare or education, provide better dependent health insurance. Bullard said, that's valuable. "Education and healthcare really offer a lot of benefits, and some of the seasonal ones, like construction and leisure and hospitality, tend to offer a lot less," said Bullard. So, for Elizabeth and Karl Hanson, it also made sense for her to provide the steady income and benefits for the family. Karl works a few different jobs, and he said Elizabeth's job as a teacher gives him freedom. "There's not a lot of healthcare packages for cabinet makers and carpenters or people who work with horses. It's unusual," said Karl. And Elizabeth loves teaching, so in her eyes, it's a win-win. "I love school. I kept going back to school and now I spend every day at school," Elizabeth laughed. According to Ben Winchester, a rural sociologist for the University of Minnesota, there has been a trend nationally for people in their 30's to move to rural areas. "Quality of life trumps everything here, it trumps a job. Primarily, people are pulled toward a life that they have more control over," said Winchester. Back at the gathering, the women said they love their jobs and are doubly grateful that those jobs allow their husbands to do what they are passionate about. And Elizabeth said, Wyoming, and especially Cody, attracts people with independent spirits and a frontier mentality. "We do have a lot of people in these roles where women have steady jobs and benefits and men have a mix of things that keep them going," she said. In the end, it always comes back to their choice to live near the mountains, by any means possible. "We wanted to live in the mountains and buck the system and stay in the mountains," said Elizabeth. "We have been willing to and have given a lot to do that." Last February, Jackson Hole Mountain Resort launched a new extreme skiing and snowboarding competition. 18 men and seven women competed to be crowned the King and Queen of Corbet's. At the awards ceremony, the top male won $5,000 more than the top female finisher. The incident drew attention to the fact that there's nothing in place to guarantee equal prizes in big mountain freeskiing. The University of Wyoming has a new recruitment campaign featuring the slogan "The World Needs More Cowboys." It rolled out with a video and new advertising materials, but some on campus are not happy about it. Christine Porter is a professor of community and public health, and says the slogan excludes women and people of color. Helen Raleigh is a Chinese-American UW alum. She also writes for the conservative publication The Federalist, and recently published an article supporting the new slogan.